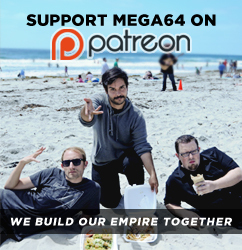 The Mega64 Podcast Episode 81 is now online! We talk about the more important announcements made at last week's CES, as well as talk about comics, gaming guilty pleasures, and of course, Sabritones. We even attempted a rough live feed, like I mentioned earlier. Will the show collapse as a result? Download and see! Watch the video version below or subscribe to the left. Audio version here. See you very soon with some more fun stuff!